In Harry Potter & The Deathly Hallows, Pt. 2, our three adventurers, Harry, Hermione, and Ron, have finally become what they were always meant to be. Their destinies are realized, and they set forth to put an end, one way or another, to the fight between Voldemort's army of Death Eaters and, presumably, the rest of the wizarding world. They are no longer slowed by doubt; it would seem they've accepted the possibility that they may not live to see the next day. Their eyes have a fierce spark to them, previously hidden by fear and uncertainty. Fully realized wizards or not, their course is set, and there is truly no turning back. Unexpected casualties occur, heroics arise where cowardice previously sprang, both compassion and pure depravity are present throughout. 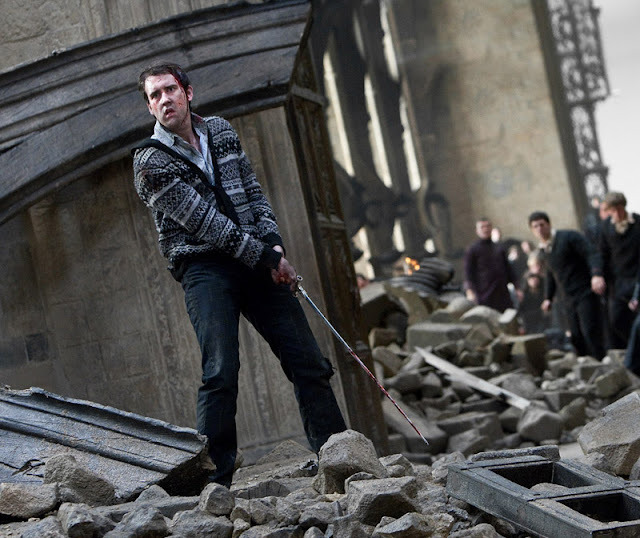 HP7II is, all around, a flooring movie. I was shaken and surprised on so many occasions that it wouldn't matter to count them. A death of a central character near the end is portrayed in such a heartless, brutal way that if it had been pushed any further the movie would have been R-rated for sure. The sound related to that death is still with me almost a week later. The acting is superb, well above par not only for what some may call a Young Adult Movie, but for a summer blockbuster, for a movie with young actors, and really any other movie out there. The score swells the heart. The cinematic images are awesome, in both the pure and now diluted sense of the word. The computer generated visuals are flawless. These qualities may go without saying, but I think it important to note that none of them stand out, and all of them add to the immersive nature of this movie, never taking away from the story, which is the case with other more recent summer block busters. But as great as HP7II is, it is not complete. 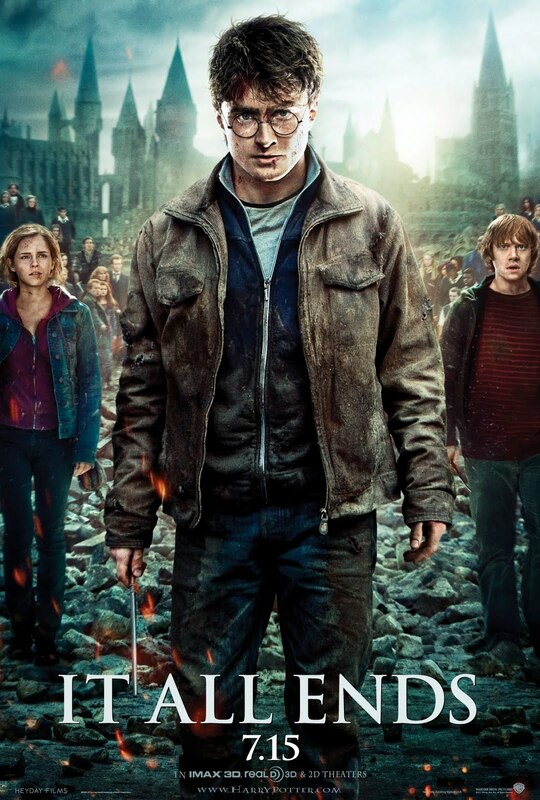 Harry Potter & The Deathly Hallows, Pt. 2 has a cold start. The movie begins with Harry, Hermione, and Ron, still recovering from the traumatizing, nigh-hopeless escape and near-defeat at the end of Pt. 1, sleeplessly ambling about an old beach house, reflecting upon the circumstances that just came to pass. It honest-to-goodness felt like I came into a movie half way through. Now, it may seem like I should have expected this, but that's a bunch of malarkey, and that's why I feel cheated (hold your horses, keep reading). I personally feel like both Pt. 1 and Pt. 2 are hindered by the choice to split the adaptation into two movies. The first part feels truncated, with an incredible climax that comes and sweeps us off our feet, bringing more than a few people (myself included) to tears, and then just ends, like a bottle rocket with a beautiful flare, but a dud internally. I felt like I had rug burn it was such an abrupt end. Then the second part unsympathetically just starts, as though it expects us to have sustained the emotional state we were in when Pt. 1 ended. Granted, the ending of Pt. 1 was eye blistering brutal, but to maintain that heat over 8 months is asking a bit much. That said, this feeling of walking into a movie halfway through was my only complaint. And I do understand why they did it, even if one of the many reasons was to make more money, which it probably was. But if that's what they needed to do in order to get this masterpiece to my welcoming eyes, you'll never hear a complaint from me. It's a magnificently constructed cap to a rocky set of seven movies, and if anyone tries to tell me that there are 8, I'll claim ignorance, because, despite the way the movies were released, I only saw seven. Side note: I did end up seeing it in IMAX 3D. I hate 3D, and I usually use it as the litmus test for movies (if it has 3D, I don't wanna see it). I must admit that the only reason I saw it on IMAX 3D is that I knew I would never have a chance to see it that way outside of theaters, so I figured I'd splurge a little. I can honestly say it didn't add a darn thing, and, as I've always felt when I've seen other 3D movies, the 3D took away from the experience, rather than enhancing it. All in all, I'll be glad when I can sit at home and watch Pt. 1 and 2, uninterrupted, and in glorious 2D.